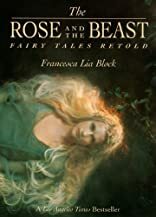 The Rose and the Beast: Fairy Tales Retold was written by Francesca Lia Block. The Rose and the Beast: Fairy Tales Retold was published by Joanna Cotler Books. About Francesca Lia Block (Author) : Francesca Lia Block is a published author of young adult books. Some of the published credits of Francesca Lia Block include How to (Un)cage a Girl, Echo, The Rose and the Beast.